There was lots of wind and rain overnight, with storm rolling through on Wednesday morning. Stuart and I waited until conditions settled down a bit then headed to Hampton. We got on the water a bit after 1pm. I took out my Crossbow 7 as conditions looked "full" and I didn't want to be overpowered. It was the right choice. I had plenty of power, particularly using the S-Quad surfboard. Small kites are nice to fly. We headed over to Green Point to catch some waves, then returned to Hampton. There was a nice bay surf breaking between the rock groynes, and further out in a few places. The surf on the main beach was great too. I was concentrating on both heelside and toeside powered turns and riding toeside. The waves were nice, and the wind consistent. There were about 10 kiters out when we arrived, mostly on surfboards. Many had departed by the time we finished. The sea breezes are gone now, so its great to score a session like this as we enter the "winter doldrums" - and storms. I took this video with my helmetcam. 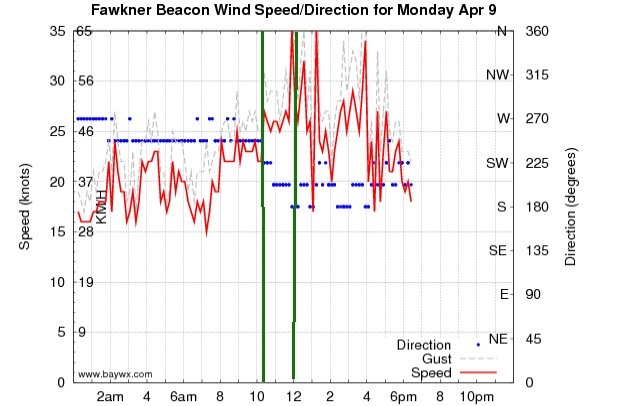 Here is the wind chart. 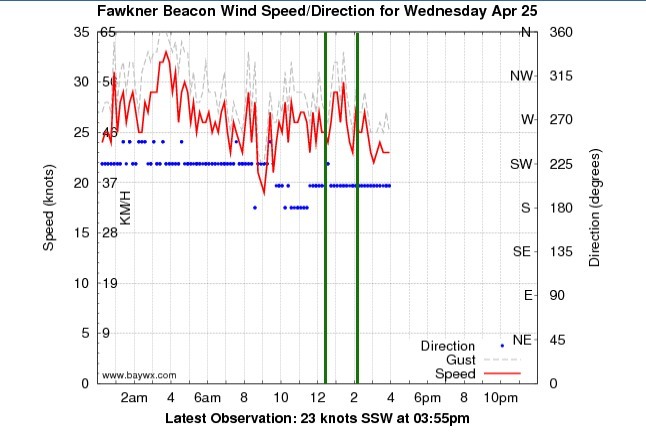 Some gusts nudged 35 knots. Strong westerly today at Hampton as storm fronts rolled through all day. I got down to Hampton at about 10am and it was howling. Winter is on its way - it was cool and dense wind, and gusty too. I was tossing up between my 7 and 10. The wind dropped a bit to around 21 knots so I took out the 10 after a bit of pfaffing with tangled lines. I was well powered - over powered in fact. I did a couple of runs through the 1m surf and then wiped out riding toe-side back in. 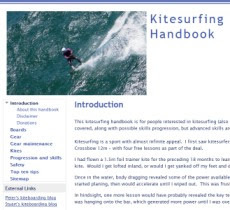 I had max depower on yet the kite was flying hard on the beach. A fellow from up the beach came and helped me land it, which I greatly appreciated. I then took out my Crossbow 7, which had enough power to get me going and was much more manageable. I did quite a few nice runs heel-side out and toe-side back. By the time I finished there was only one other kiter out. It was a decent bay swell so I was able to get some more practice on my surfboard which was great. 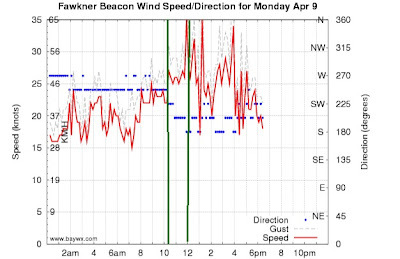 These strong frontal winds are much more difficult to kite - it pays to be careful and go perhaps for a size smaller kite. 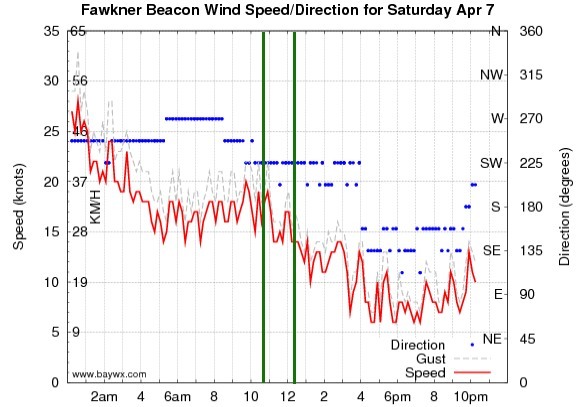 Looking at the Fawkner wind graph now the wind speed was up to 35 knots, which is well in the range of my Crossbow 7 and too strong for my 10. 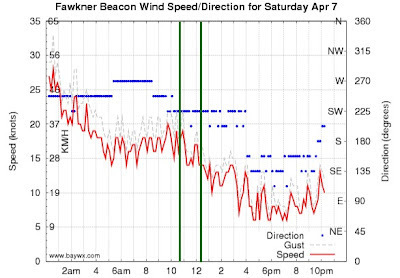 The front had gone through by Saturday morning but there was still reasonable wind in the morning. I headed to Hampton and went for a great upwind tour on my Sector 60 with my Switchblade 10. 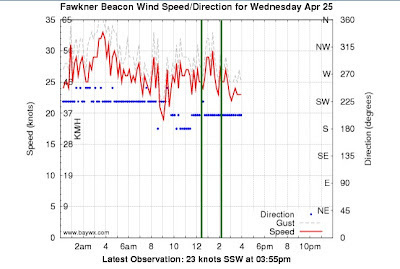 I had no trouble at all going upwind all the way to Ricketts Point on one tack in the 15 knot wind. It was a nice sunny day but there were no yachts about, and only one other kiter off Hampton. I turned at Ricketts and headed back, mindful of the wind forecast that it would drop at midday. I came close to shore and kept up a good speed. I cut behind the Cerberus wreck - wondering for the umpteenth time why it has not been salvaged and restored. The wind cut out almost exactly at midday, so I came to shore at Sandringham, packed away my kite and walked back along the foreshore. I was glad I wasn't further offshore. I finished the outing with a nice coffee and muffin at the Sandy HQ beach cafe. Going touring is a lot of fun. I still find it amazing to get such a good session from conditions that would have seen me struggling to even get going on a twin tip or surboard. The Sector 60 opens up a new dimension in kitesurfing. Here is some video from the tour, taken with a Contour ROAM board mounted.